OK, let’s see how many annoyance boxes it ticks. +3 disk? Check! Like sunteam’s games, this will only run on one of those new-fangled Amstrad things with the diskette drivette thingette on the right-hand side, despite the code being a mere 8 or 9K. If this had come out back in the day I would’ve had to be content with just drooling over the reviews in Your Sinclair while sitting there waiting an absolute dog’s age for Out Run to multiload into my battered old 48k machine. 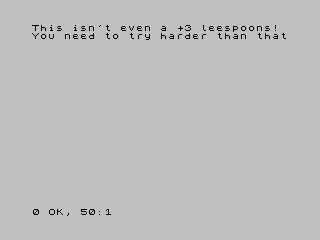 Of course, under emulation anyone can “own” a +3, but that’s not the point, is it? There’s no fun at all in opening a file for it to load straight away – no loading screen, no anticipation, no Schrödinger’s Loader (will it work, or won’t it?) and no loading noises! Ha. Hahaha. Very droll. Now I suppose I could go through the code and work out how to disable this message, but I think I’ll leave that as an exercise for the reader (if there are any left, that is). 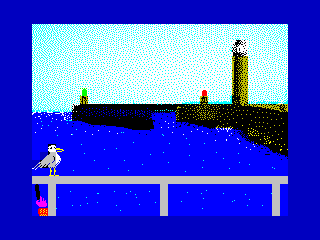 Picture the scene, you’re standing on the promenade at Whitby, about to tuck into your chips. However, as you open the awful polystyrene box with a squeak, a squadron of herring gulls surround you with their beady eyes locked on the greasy fried potato morsels. 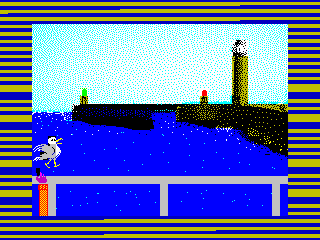 It’s every gull for himself and in the ensuing carnage you are lucky to escape alive. Hungry, and with clothes in tatters you sneak away vowing to have your revenge. In this exciting game, you turn the tables on those pesky critters. Armed with a pointy stick you return to the scene of the crime and merrily take your revenge. When you have had enough of prodding marine fowl, don’t forget to press the Q key to exit and see your score! Couldn’t have put it better myself. So the game begins, and oh my word look at those graphics! I haven’t seen such artwork on a Spectrum since the days of Trap Door and Flunky – if I didn’t know better I’d wonder whether p13z is actually a pseudonym for Don Priestley. Being a soft southern shandy-drinker I’ve never been to Whitby, but now I won’t ever need to – this game is so realistic that I can almost smell the fish and chips wafting across the bay from the direction of that giant yellow trouser-snake on the right-hand side. (That’s supposed to be a lighthouse! Ed.) Guesser is rightly proud of his sprite engine, as it features “buffered drawing”, “screen flipping”, and a technique he calles “repurposing the flash bit in the sprite data as a transparent paper colour flag”. No, me neither. After the novelty has worn off, which takes about three seconds, I realised just how bad ASSTS is. The scoring system is rubbish – you don’t even know what you’ve scored until you quit the game. It only works on a machine which most people don’t have, and other than sending me completely over the edge it has no purpose or point whatsoever (unless you count the point of the pointy stick). But on the plus side it’s a crap idea well executed, which certainly makes a change from a crap idea executed crappily, and it gives those poor deprived +3 owners a chance to endure the loading noises suffered for years by us lesser mortals. Plus it did make me laugh, so I award this piece of gull guano from Guesser a whopping +3 percent!